September 2016 News - The NPS has reported someone drove up and down on the Racetrack, "... leaving miles of tracks." Driving is not permitted on the Racetrack. See photos here. The Racetrack is a unique attraction of Death Valley National Park that not many park visitors get to see. It's a dry lakebed in a very remote and beautiful area. On the north end of the lakebed is a rock formation known as the grandstands. Rocks from the grandstands and other nearby formations break off and fall onto the lake. There, they perform feats that make this remote playa world-famous. They move! But after all these years, a hundred or more since this phenomenon was brought to the attention of naturalists studying Death Valley, no one has ever seen them move. These rocks aren't boulders; most are perhaps a foot or so tall, but can still weigh a lot and are not easy to lift. The evidence that they move is the trails they leave behind them as they scoot around the lake. You'll find a rock sitting innocently anywhere on the playa -- from next to the grandstand to the far southern edge -- and behind it will be a trail, from the rock sliding across the fine clay surface of the lakebed. When this phenomenon was discovered around 1900, observers speculated that magnetic forces were the cause. Now, however, scientists believe they have solved the mystery of this movement. It occurs, they believe, when there's been enough rain to wet down the lakebed, then a strong wind -- as much as 70 miles per hour in this area -- blows the rocks around. The surface of the lake is a fine clay that becomes extremely slick when wet. But since no one has yet seen them move, this is still just a theory. When we hiked out to find one of these lithic travelers, we walked from one to another but most had no trails, no sign at all of doing anything unusual. But some rocks further north did not let us down. 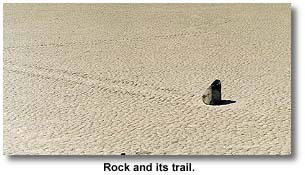 The trail in the dry playa was clear; this rock had moved, moved a substantial distance, several hundred feet, without human or animal help; there were no tracks around it, no record of assistance, just the path it made as it slid through the mud. It had changed directions, several times. It was easy to see the record of various windstorms, and imagine how long they lasted; some a short time, some for days, with wind coming from different directions making the rock slide in different ways. We found others nearby. Interestingly, the patterns the rock trails had made were different from each other. Since the scientists believe they are wind-blown, we expected to see paths that parallel each other, or follow the same pattern. This wasn't the case. 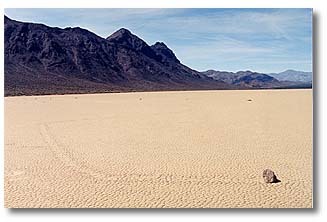 According to the National Park Service, there are 8 other playas near Death Valley where this phenomenon occurs. The mix of a clay-bottom lakebed, enough moisture to make it slick, rocks and strong winds occurs at these locations, too. The Racetrack is located beyond Ubehebe Crater, which is southwest of Scotty's Castle of Scotty's Castle. 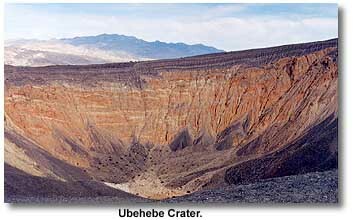 Coming from Ubehebe, the National Park Service advises that 4-wheel drive may be needed to get there. The 4-wheel drive requirement seems (under normal weather conditions) overcautious; on the day we traveled it, the road was washboarded, but graded and easy, usually fit for the family sedan. The Racetrack is not an illusion It is well worth the washboard ride, or the hours of 4-wheeling it takes to reach the lake from the south. 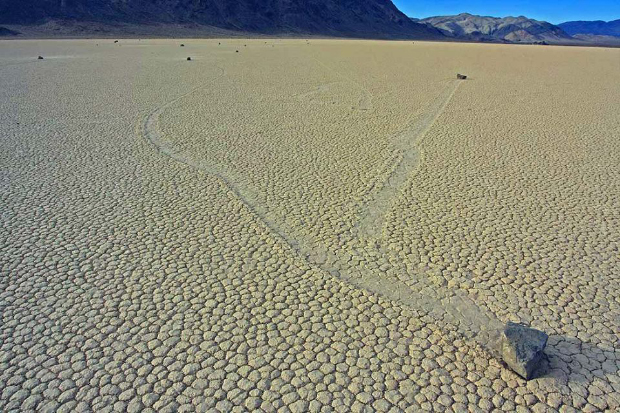 Update August 2014: For more than 50 years, scientists have puzzled over rocks that seemed to move across the dry landscape of Racetrack Playa in Death Valley National Park. They could see their trails but only speculated how they might have moved from point A to point B, not seeing one actually in the act of transit. Until now. Watch time-lapse video of the rock-movement phenomenon and learn the secret.